After a long festive holiday, and with hope of a prosperous year coming up, the Citypassguide.com team has decided to celebrate on the Bassac Cruise in Mekong Delta and in Can Tho City. Can Tho Bridge is the only gateway to access the city from the Northern provinces. It is currently the longest main span cable-stayed bridge in Southeast Asia and ranks 24th in the world. You will easily recognize its special red colour as soon as your car approaches it. At night, the bridge is lit up with hundreds of lamplights making it a must see from Ninh Kieu wharf. Local insight: If you’d like to take picture of Can Tho Bridge, ask your driver to pull over at the first crossroads after reaching the end on the Can Tho side. 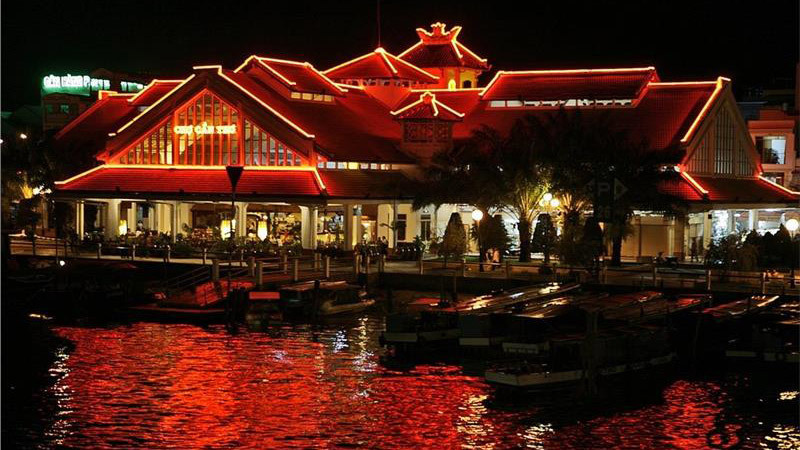 Can Tho city is famous for its Ninh Kieu wharf where most visitors go. The old Ninh Kieu port was extremely busy during the war period but it is now a peaceful and poetic part of the region. Ninh Kieu wharf is always ready to service visitors who desire to visit the floating market, enjoy special “river” food or just observe the routine of locals on the Mekong Delta. It takes around 30 minutes and the cost varies from 50,000-100,000 VND per person to transfer from Ninh Kieu wharf to Cai Rang floating market. Local insight: For those who are late for the early boat, you can take a bus for 5,000 VND, a taxi for 70,000VND or a Xe ôm for 20,000VND to reach Cai Rang Bridge and turn onto Vo Tanh street to rent a small boat for 50,000 – 70,000 VND depending on junk or motorboat. The market is crowded in the early morning. It was my mistake to leave for Cai Rang floating market at 5.00 a.m. I did not see the lively market that I had imagined. I was also unable to take a picture of the breathtaking sunrise at Cai Rang floating market. This time I will set off at 6:00a.m to see barges heaped with different soils, wooden fishing boats, single long boats overflowing with fresh products and large boats packed with fellow sleepy-eyed tourists. All this traffic devoted to commerce. Often your tourist boat will take you to a big floating house close to the river bank but don’t buy anything here. Ask your guide to take you to the middle of the crowds where the locals gather to buy and sell. Those are top 3 main things that I love about Can Tho City. I will take this chance to check out the Bassac Cruise and give my own feedback and consider whether it could be my fourth main thing to do when I find myself in Can Tho again. Are you in Can Tho for a day or two and wondering what to do? 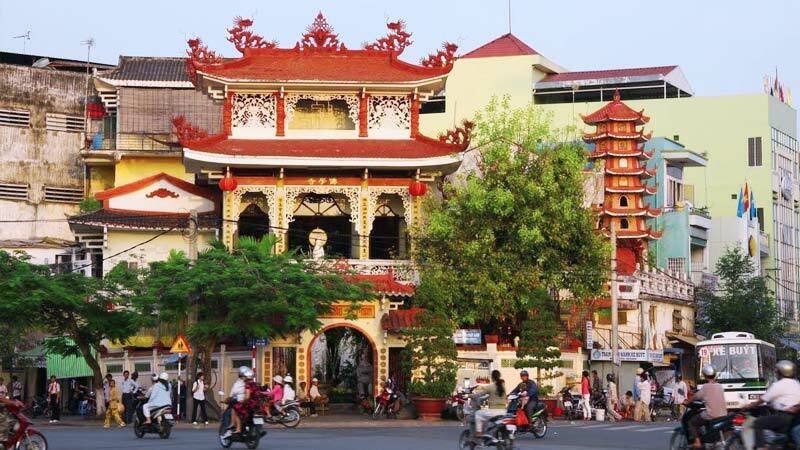 Although the most developed and populated city in the Mekong Delta, Can Tho is a peaceful place, a respite from the noise and pollution of equally large cities throughout Vietnam. The city still retains charms of classic Vietnam, while reasonably catering to tourists without becoming as kitschy or schlocky as some other regions of Vietnam. While more alive at night due to the absence of heat (there is not much shade in the city during morning and afternoon hours), there is also plenty to do during the day in Can Tho. Here’s what you can fit in if you’re doing a quick stopover. Depending on when you arrive, there are three different locations we’d recommend - and which you pick depends on your preference. You may want to head to a side street off Tran Van Kheo if you’re coming in at night and leaving the evening after. A street like Tran Dai Nghia has plenty of one-stop accommodations for affordable prices (US$15-US$20) and plenty of great late-night street eats along Tran Van Kheo. Most hotels on Tran Dai Nghia stay open throughout the night and don’t shut their gates after 11 p.m., meaning you can come in on a late bus and not have to worry about booking through an OTA. 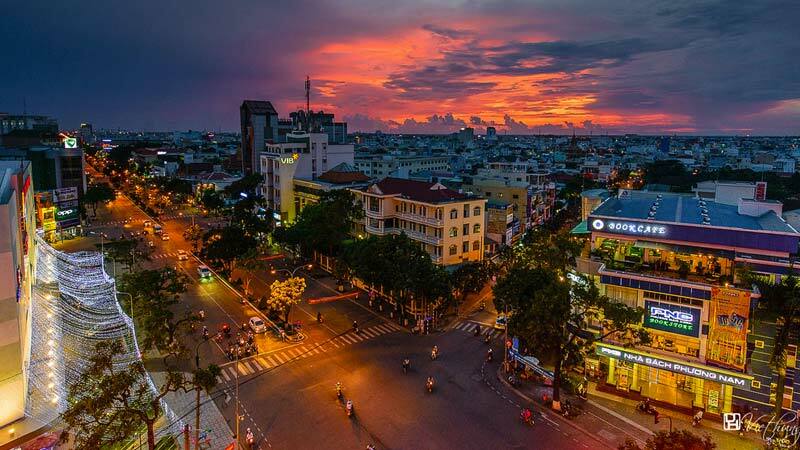 If you choose this location, it will take you about 15 minutes of leisurely walking to get to Ninh Kieu Pier, the most famous area in the center of town. On the way you’ll pass Nguyen Trai street, which is full of fashion outlets, including Adidas, New Balance, Converse, Vincy, and many local Vietnamese clothing shops, all of nice quality. The second option would be placing yourself right at the center of Can Tho, right by Ninh Kieu Pier. For this, you cannot go wrong with Nam Bo Boutique Hotel, spearheaded by the same owner as Bassac Cruises. This is the tourist epicenter and a great place to branch off from whether you’re coming morning, afternoon or evening. For less stylish accommodations that are near Ninh Kieu Pier, look to Ngo Duc Ke and other side streets off Hai Ba Trung, which stretches along the waters. The third option would be to start off at the far end of Hai Ba Trung. 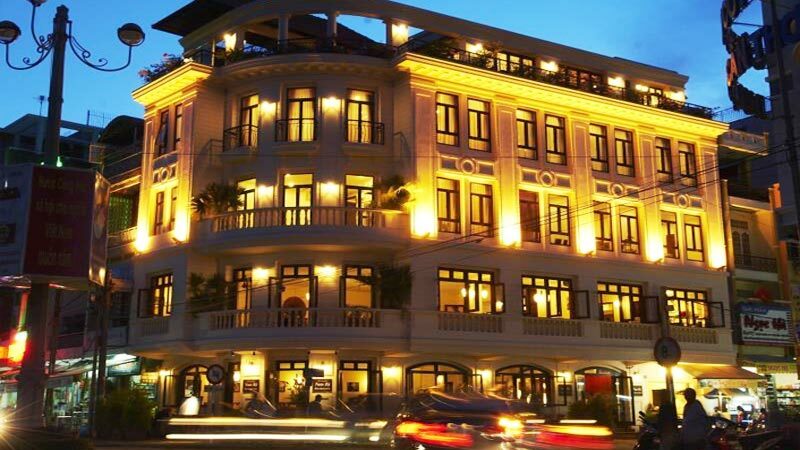 West Hotel on X is a well-appointed, modern 4 star hotel that is right in the middle of an outdoor morning vegetable market that stretches along the far end of Hai Ba Trung. This active, colorful morning sight is a great photo op, with fresh vegetables and seafood sold right by your feet as you step out of the hotel. You then follow Hai Ba Trung to reach the pier. The largest floating marketing in Can Tho, and one of the most popular in the world, the Cai Rang floating market is an exciting, colorful hub of commerce in the middle of a large spread of river. Tours of the market are most active during the 5 a.m. to 7 a.m. time frame, so if you want to book something directly from your hotel, keep these times in mind. 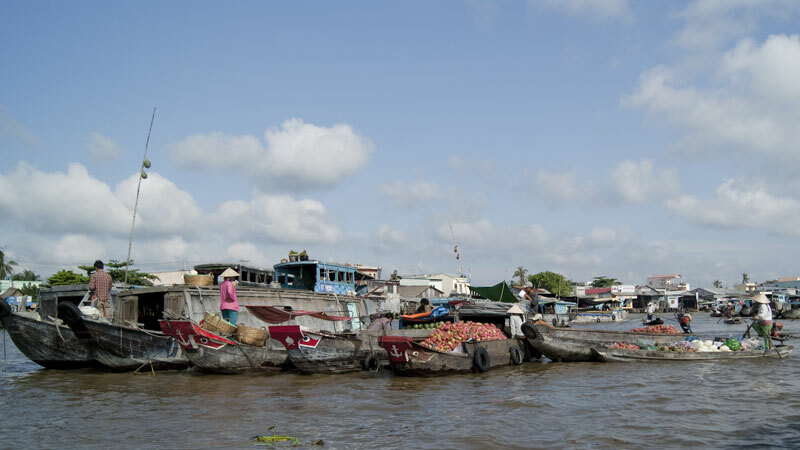 Alternative ways to get to the market include taking a taxi or boat from Ninh Kieu Pier. Any of the locals offering boat tours at Ninh Kieu Pier will understand where you want to go when you tell them "cho noi Cai Rang", as will taxi drivers. 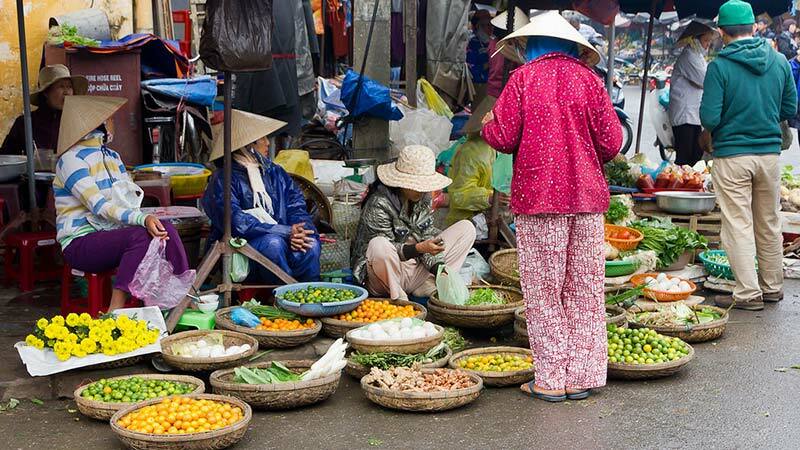 If you don’t want to pay tourist prices and would rather opt to discover the market on your own accord, take an early taxi to the nearby Cho An Binh market, which is right by the Cai Rang floating market. Then, walk along the riverside to find a stray work boat. For about VND 50,000 per person (this is what we negotiated the last time we went down here), you can jump on a work boat for an hour while they go about their commerce activities. This gives the “tour” a more authentic feel and you have more freedom to swim up to the merchants you actually want to buy from. Purchase and enjoy some fresh fruit and local milk coffee (ca phe sua da) at the market before heading back to the center. De Tham street is the popular food street in central Can Tho, but for breakfast, grabbing a quick dish out of any of the many streetside eateries (or at l’Escale on the ground floor of Nam Bo Boutique Hotel, which serves some good Vietnamese milk coffee) will suffice. Museums are great for morning visits as you are still ripe to take in some information, as opposed to later in the day when you will want to unwind. The Can Tho Museum and Can Tho Military Museums are located in the same area. 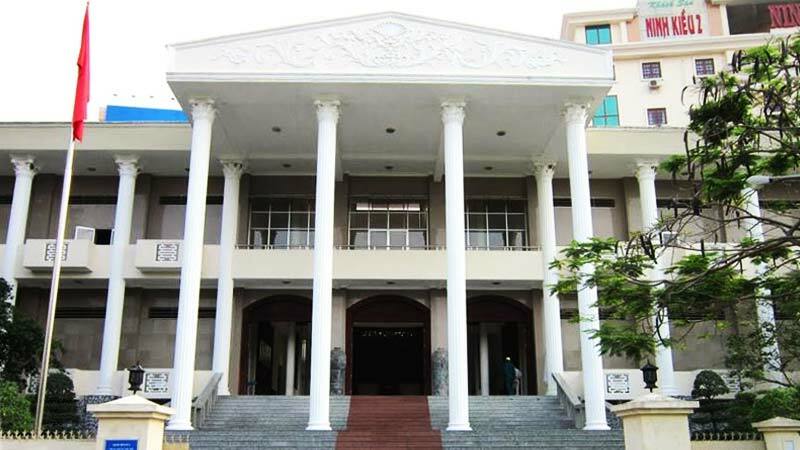 The Can Tho Museum is worth a decent 30-minute look through, with the first floor a strange medley of plant samples, wooden models, preserved snakes, ancient artifacts, pottery, Chinese, Khmer and Viet musical instruments, sartorial artifacts, agricultural tools and more. The second floor is dedicated to the American War and showcases weapons, damaged pieces of military vehicles, photos, currency, medals and more. It’s much like other Vietnamese general museums throughout the country. There is no entrance is free, so stroll in at your leisure. There is a cafe right by the entrance steps for a post-museum pick-me-up right after. A quick stopover at the military museum around the corner is also warranted if you found the second floor of the Can Tho museum interesting. 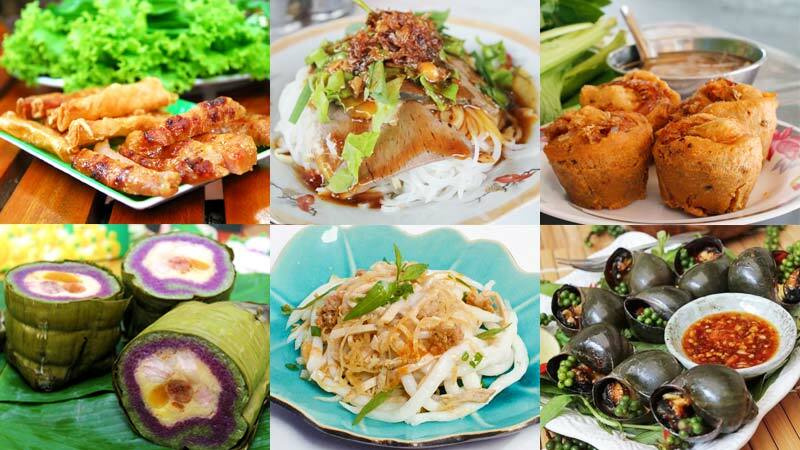 Invariably, many would recommend De Tham street as the food street in central Can Tho. Truth be told, there are many excellent street and up-scale variants so it’s not so much a hit-or-miss like other parts of the country. Still, if you’re hungry, a double portion at a restaurant like Tan Phat, which serves classic Vietnamese dishes such as chicken over rice (com ga xoi mo) and beef, onions and rice, or com xao bo - both addictive and very well made for the price point. A must for those that want to get full on street food without it feeling cheap or lacking. There are a few noteworthy temples to visit after a quick stopover at your hotel. Later in the afternoon is a good time to start exploring, as the noon heat dies off and visitors begin to attend to their duties. Phat Hoc is perhaps the most famous pagoda in Can Tho, with five levels and a ground floor consisting of statues, a bookstore and a giftshop. The top level provides a nice aerial view of a slice of Can Tho, notably the pointed tops of the two nearby Khmer temples, the closest being the colorful and lavish Munirangsyaram pagoda. The fifth floor of the Phat Hoc Pagoda has a monk playing a musical instrument around 6 p.m., so stick around till nightfall if you wish to see the ritual. For a more local but equally pretty temple, head over to the Binh Thuy temple off of Cach Mang Thang Tam. The residential area around it provides a nice slice of local life and a decent selection of street food. Come nightfall, you will likely want to unwind after a day of walking about and exploring Can Tho. Dinner at l’Escale is a great way to tie things up. If you’re feeling like beer by the beach, grab one at any shop and head to pier for a quiet drink by the waters, or grab some street food the Can Tho night market and munch away with the active mix of tourists and locals along Hai Ba Trung. The Can Tho Market, simply labeled Cho Can Tho, is a pretty building along Hai Ba Trung that has Western-Vietnamese restaurant at the back called Sao Hom. The open-air eatery overlooks the waters and is a pleasant place to relax after a long day of exploration. There are a number of bars and some clubs along Hai Ba Trung, and tons of karaoke joints scattered throughout the city. V18 Club is the closest you will get to large-scale nightlife, and this is a decent option if dancing, cocktails and spirits move you. A few bars across from the pier serve moderately priced drinks as well.